OK I had to bring my Windows machine out of storage to play Sims Online. Blah. But the game is great. I'm still a newbie, but if anyone else is playing, look me up. I'm "Joi Ito" in the Test Center. I still have my other two sims so if you tell me where you are hanging out, I can put a sim there. hmmm.. any relation between you dusting off your PC to play this game yesterday and the announcement of There.com landing a new $11 million investment? Seems like someone thinks these 'realistic' chat rooms are gonna be big. I love the sims game. I have the Sims double deluxe. you can make your own house on it. IT ROCKSS!!!!!!!!!! I love it so much and I want it!!! Hey, do you know a way that I could play the sims on the Internet? i love it so much ,I would love to buy it.I wish they had it for free. I just think it would be cool if you could make a live online game where others could play with you. Almost like real life.. you're in control of you and you have others to meet ect. Caroline, you mean something like... uhm... World of Warcraft? 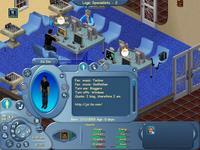 Listed below are links to blogs that reference this entry: Sims Online. Joi Ito - "Sims Online" by Joi Ito is licensed under a Creative Commons Attribution 4.0 International License.